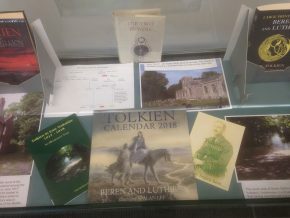 A small Tolkien Exhibition has opened in the Hull History Centre and runs until 31 October 2018. Phil Mathison, the author of Tolkien in East Yorkshire, has been trying to organise something on these lines for the last five years. The current exhibition marks the centenary of Tolkien’s departure from the area after spending nearly 18 months here during 1917-1918. he had returned from the Battle of the Somme after contacting Trench Fever in October 1916. 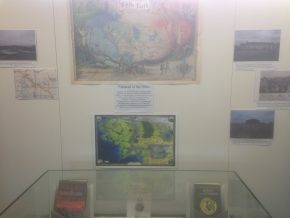 There are two colourful maps of Middle-earth on the walls in the centre, over a Beren and Lúthien cabinet. This includes an illustrated Silmarillion, 3 photos of Roos, a large print Beren and Lúhien, and the 2018 calendar. 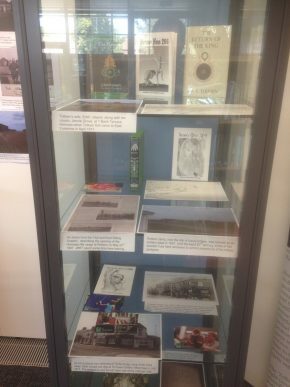 One side cabinet focuses on Hornsea and Withernsea, and includes photos of: Margaret Strickland-Constable, 1 Bank Terrace (where Edith stayed), a detail from an OS map, and Hornsea Musketry Camp. Withernsea is represented by Edith’s lodgings at 76 Queen Street, The cabinet is sprinkled with copies of Amon Hen, The Hobbit, and The Return of the King. The second side cabinet concentrates on sites in Hull associated with Tolkien. Here, there are photos of Brooklands Officers’ Hospital and the former Endsleigh College. A photo of Mother Mary Michael who visited Tolkien at Brooklands is included, as is a copy of one of his medical reports. Extra colour is provided by copies of Amon Hen, Mallorn, The Fellowship of the Ring, and a recent hardback Hobbit. The central notice states that Tolkien left the area on 11 October 1918, but Wayne Hammond has proved in a recent email to me that Tolkien actually left for Blackpool Convalescence Hospital on 11 September of that year.